Drew Thomas was originally scheduled to wrestle Travis Dixon but his Dr's wouldn't clear him for the event. Travis came out and demanded a match and challenged anyone in the back. Fan favorite Devin Worthy, Answered the challenge. General Manager Primetime said there was gonna be a special guest referee for the match and it would be none other then The "Undefeated One" Drew Thomas. Just when Devin was gonna put Travis away James Anthony, came out to taunt Drew who left the ring to chase after James. This left Travis enough time to hit the big boot on Devin and get the 1-2-3 when Senior RWC Official James Hunter came to the ring. Match 3: Kris Nemesis defeated James Anthony to retain the RWC No Limitz Championship. James hit Kris with a missile dropkick from the second rope and was going for his finisher when Drew Thomas came out but was stopped by his best friend Devin Worthy. James would taunt Drew and tell him to get in the ring and when he turned around Kris hit him with a Code Breaker for the 1-2-3. After the No Limitz Championship match Flex Simmons who was sitting at ringside, got on the Mic and said "since Devin & Drew wanted to fight so bad how about they get in the ring and face James Anthony and I", General Manager Primetime stated it would not be sectioned by RWC cause of doctors releases. James would sit on the outside of the ring for most of the match until Flex was able to out smart Drew by having him clothline his neck on the top rope. James would then tag himself in and go for the kill on Drew but was able to catch him with a dropkick that sent him flying to the outside the ring. and James got counted out but then challenged Devin & Drew to a Tag Team Match next show on March 17th against him and a Mystery Partner of his choosing that would not be on the RWC roster. Lynzee went for a splash in the corner but Dani moved and used a school boy and unbeknownst to the ref, her feet on the ropes for the win. 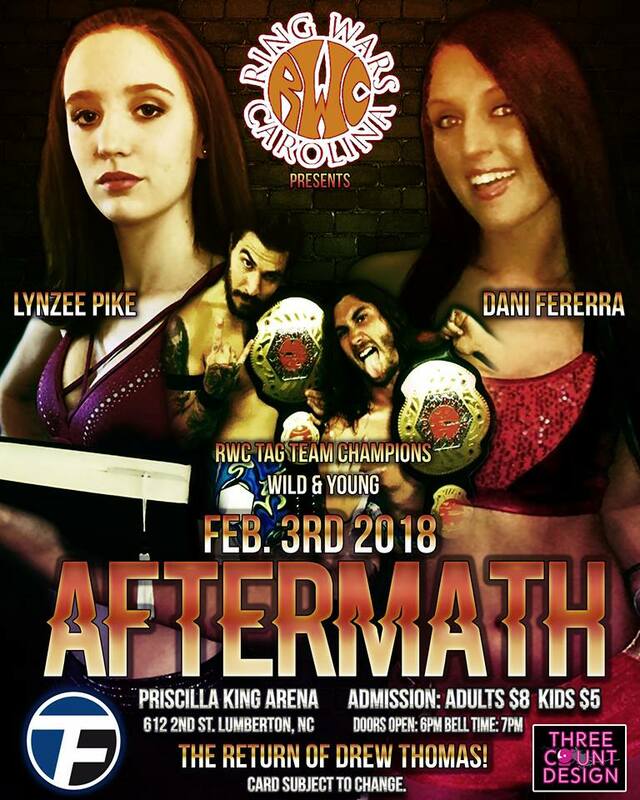 After the match Lynzee would tell General Manager Primetime she wants one more match with Dani on March 17th but this time to keep her from cheating she wanted it to be a Lumberjack Match, which he granted her. MAIN EVENT: Chance Lebeaux & "Mr. Everything" Victor Andrews ended in a NO CONTEST. Travis Dixon came out of and hit Victor with the Big Boot and this lead to a 2 on 1 situation. 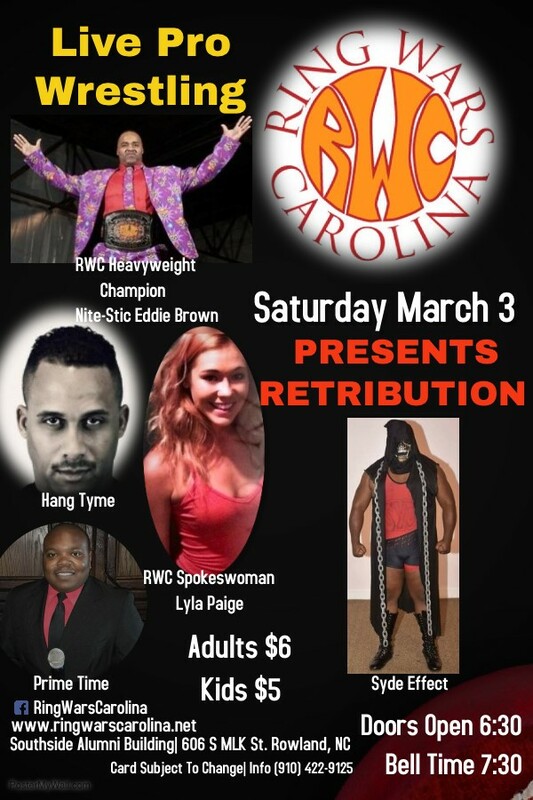 RWC Heavyweight Champion Nite-Stic Eddie Brown came to the ring and made the save. He challenged Travis Dixon & Chance Leabeux to a Tables Match against himself and Victor Andrews March 17, 2018 in Lumberton NC.